In our 2014 Winter issue of Food for Thought, we look at how mindful eating might be used to prevent diabetes. Articles include ideas and suggestions from Megrette Fletcher, MEd, RD, CDE, who explains, “Without awareness, you may discover this fast-paced highway called Life leads directly to diabetes.” Jean Kristeller, PhD, creator of MB-EAT-D, helps professionals consider bringing mindfulness into their diabetes education. “Mindfulness can be introduced both as a relaxation approach, in regard to managing stress, AND as an effective way to learn to make healthier and wiser choices about food and eating.” Mary Farhi, MD, says, “When we are in balance, we have energy, efficiency and vitality.” Her article is also a patient-care handout. View previous issues of Food for Thought here for more mindful eating ideas, benefits and practice approaches. The Center for Mindful Eating is a member-supported organization. Please consider becoming a member, or making a donation, to support our work providing free mindful eating education resources. Let us start the New Year in gratitude to our members! Thank you to all of our Center for Mindful Eating members for your support. This organization just wouldn't exist without your donations and membership. Thank you to all who have made The Center for Mindful Eating a viable resource, benefitting many people around the world. In 2014 we would like to invite our members to become more involved by way of sharing their expertise, skills and creativity. One of our five year goals is to obtain educational credits for our recorded teleconference programs. If you are a TCME member and a mindful eating expert with more than 5 years experience would you consider becoming a TCME teleconference program reviewer? To submit your resume and learn more about what's involved, please contact us - your help in this area will be greatly appreciated. 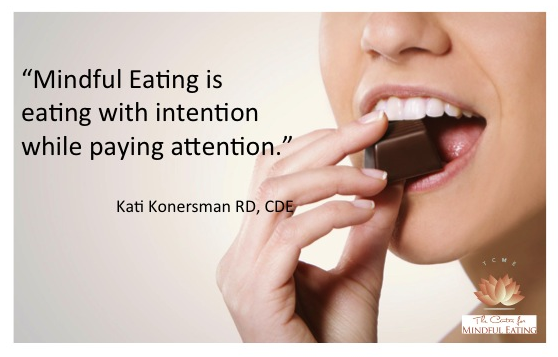 The Center for Mindful Eating is also on Facebook, Pinterest and Twitter. These social media outlets are our public expressions of mindful eating. Please encourage people you know and work with to explore this rich and often humorous resource as they learn about mindful eating. In 2014 Food for Thought will be getting redesigned! We are grateful and continue to welcome donations from members to help us with this project. The new format will be an expanded full color magazine that will be easy to read online, and to download for personal use. The goal of Food for Thought is to showcase how mindful eating is changing the minds and lives of people while promoting a balanced, respectful, healthy and joyful relationship with food and eating. Would you like to make an extra donation to help with our Food for Thought expansion? Donate here! Learn More, by accessing the Personal and Professional Training section. The Center for Mindful Eating members know that people hunger for more than food. Many of you are hungry to learn about Mindful Eating. If you are a TCME member you can showcase your program and work in the Find A Professional searchable database. You can also check out the listings for personal or professional development in the Events Tab. If you are currently offering a professional mindful eating training program, that provides CEU, CPE, CME’s from a professional organization please contact us. We want to learn more about your program and share the growing number of professional trainings with over 50,000 people that come to The Center for Mindful Eating website! Many of you know that Food For Thought is our free newsletter that The Center for Mindful Eating has been producing since 2006. Food for Thought offers an in-depth article, a handout and a mindful eating practice opportunity. In the last year, while redoing the website I had a chance to review the 31 issues that are located on the member’s site. As I looked at that body of wisdom, I felt myself falling into a memory that changed me. Looking at those 31 issues, I see the wisdom and passion of many wonderful mindful eating experts that have served on the board or have been invited to write for The Center for Mindful Eating. The interest and understanding of mindful eating has been captured in words, published to a website for you to read. We have also created a book of the handouts for you and your patients to benefit from. This book is free for individuals. If you are a professional and would like to use this resources, you can download the individual PDF from the member’s site. In January 2014 Food For Thought will be exploring Prediabetes and mindful eating. If you work in the field of diabetes, please let us know. We want to include the wisdom of our members and share how mindful eating has benefited you and your patients. Contact us to learn how you can contribute! In 2014 we are planning to redesign and expand our Food for Thought newsletter, updating the look and feel of it while making it easier to view on your mobile device. Would you like to help make that possible? Donations to The Center for Mindful Eating are fully tax deductible. Your contribution will help us improve our publications making them more easily accessible and various mobile devices. Donate Here! Every week we hear from people around the world who have appreciated our free online resources - our Food for Thought newsletter, free teleconferences, patient handouts, and more. Our new website (launched in the summer 2013) has dramatically increased our reach, allowing us to spread the positive and health promoting message of mindful eating to thousands of people longing to improve their relationship to food and eating. In 2014, we would like to update the look and expand the content of Food for Thought, our free newsletter and patient care handout which are used in professional practices, and for personal use, by hundreds of people. Do you believe that mindful eating can help people find peace in their lives? Our relationship to food is a central one that reflects our attitudes toward our environment and ourselves. As a practice, mindful eating can bring us awareness of our own actions, thoughts, feelings and motivations, and insight into the roots of health and contentment. Your support of The Center for Mindful Eating is a vital part in deepening the widespread practice and understanding of eating with mindfulness. Help us. Give a gift that can change the lives the many, give a gift that can change the world. As 2013 comes to a close, our president and co-founder, Megrette Fletcher, asks you to consider donating to The Center for Mindful Eating (TCME). We are a 501c3 Non-profit, 100% funded by donations and membership. Since its creation, TCME has grown and developed through the volunteering of it's board members. Your donation is essential to help us build and expand our infrastructure and resources such as this website, blog, email newsletter, and member support initiatives. Help us to continue to share reliable and accessible information about mindful eating on reputable websites like WebMD.com and more. Help support the free educational resources of The Center for Mindful Eating. Your donation, however large or small, will make a significant difference in the lives of many people seeking peace through greater mindfulness and awareness of their relationship to food. Give a gift that can change the world. Make your supporting donation today. The Center for Mindful Eating recognizes that people learn about mindful eating in a variety of ways. This year we began selecting quotes from our collection of writings and teleconferences and placing them with an image to communicate and inspire our community to deepen their understanding and practice of mindful eating. Michelle Racine, our Member Support/Administrative Assistant loves putting her artistic skills to work for TCME. "Finding images that communicate the messages of our mindful eating professionals is a wonderful way to reflect more deeply on the concepts themselves." She hopes that you find these offerings of benefit to you in your practices, both personally and professionally. We've provided these mindful eating graphical quotes under our creative commons license - please download and share with your clients, friends, family, professional circles and more. By doing so you are helping us in our educational mission to share the principles and practices of mindful eating. My hairdresser has a slogan that's both humorous and practical which he pulls out when disappointment rears it's head: When all else fails, lower your expectations! I always laugh at myself when I bring this one to mind as I feel irritation flare up with someone, or frustration with yet another piece of technology that decides to do something I've never seen before just because my cat walked across it. Considering that I think of her as my teacher/Buddha it should work better, not freeze up. So here we are tumbling into the holidays when tensions and emotions run the gamut, and expectations soar to "how it was" or "how it should be" or "how I'm going to make it be this year." If we become un-mindful of these conditioned patterns of rememberance and fantasy we set ourselves up for indigestion, to say the least. So lowering our expectations of ourselves and others can help us take better care of ourselves under stress. Perhaps "lowering" is just getting real about what's possible around mounds of food and people and history. Let's not pretend to set New Year's resolutions over how much you won't eat 24 hours from now. Instead, be plan-ful about how you'll take care of yourself in small ways, starting now. First, sit down and take time to bring to mind the beliefs and thought patterns that trigger over-eating. Say them out loud so you can hear them clearly. Historically that might sound like scarcity, "If I don't take some of that/plenty now, I may not get any later." It may sound like people pleasing, "I have to take a piece, otherwise Aunt Jane's feelings will be hurt," or, in the anxiety of the day and mix of people, continually eating may numb the nervous feelings, soothe the physical sensations and suppress the words . . . at least for a minute or two. Repeat. Repeat. Repeat. Invite your body to the annual event this year. -Plan to take a short walk before the guests arrive or before entering the family or in-law's house. Between dinner and dessert, say you need to stretch your legs or walk off the sleepiness, and go get a breath of fresh air -- by yourself if you can. Be present to the feel of your feet on the pavement or in your shoes. Appreciate the act of walking. Look around as you walk and notice what November looks like where you are at in this moment, and breath deeply. -Take your shoes off under the dinning room table so that you can really feel your feet on the floor when the tensions rise or an awkward silence descends. -Start right now checking in with your Stomach Hunger, don't wait till tomorrow. What's your level of hunger from zero-no interest in food to 10-unbelievably hunger? What level is comfortably full for you? -Then check in with Heart Hunger and see if you can determine what you really need. How does 'satisfied' express itself in your body and mind? -Don't forget that Eye Hunger will be scanning the sideboards and bouncing off the platters and bowls, and Mouth Hunger has only a one note tune: "More, more, more!" -Use Alternate Practice at the table to slow yourself down. When you eat, just eat. Then, put your fork down to converse. When you talk, just talk. Although by not talking while eating you're taking care of yourself, this is really a very respectful of others as well. When you put your fork down to listen and respond to someone, they feel as though you care about what they are saying, they feel "heard," and everyone appreciates that. It's also less noticeable than trying to chew 50 times! -On first go around (and definitely give yourself permission to have seconds if you do this) either put only those items on your plate that are your mos-test favorites or take smaller portions of multiple foods, reminding yourself you have permission to have more. -Sit where you can view the day's antics and interactions as though you were watching a video: you're behind the camera, and everyone else is acting out their role in each scene, they know their part by heart, the script is very familiar, in fact you could probably prompt them if they forgot a line! "Roll it! Enter stage left. Take 10!" -And definitely don't forget to have a sense of kindly humor handy. Nothing tastes better on the lips than a laugh! In this time of giving thanks I can not help but smile as I reflect on the success of The Center for Mindful Eating. What many of you may not know is like most delicious memories, The Center for Mindful Eating happened at a kitchen table. I remember the self doubt I felt, when in 2005, I let my 'crazy' idea to create this The Center for Mindful Eating tumble out of my mouth. We all need support. Regardless if you are new to mindful eating or have been practicing for decades, the giving and receiving of support is at the heart of The Center for Mindful Eating. Which is why in 2013, The Center for Mindful Eating agreed to take the message of mindful eating global, and we are blessed to welcome Caroline Baerten, a dietitian in Belgium, to our Board of Directors. Caroline explains that in Europe, Mindful Eating is a growing movement not because of obesity or a specific health concern, but because it promotes a more connected view of eating and health that Europe is eager to embrace. From all of the Board, we express our deepest gratitude for sharing in the vision that mindful eating offers an alternative view of food and eating. It is a simple idea that has grown into a vibrant, international non-profit organization that is 100% member supported. Our intent is to have this blog post offer another way to reach out to members, expand our service and working with other organizations to promote the concept of mindful eating. Thank you again for joining us in this vision.